If you're looking for some beach reading - and you're not afraid of pirates - this might be a good choice. 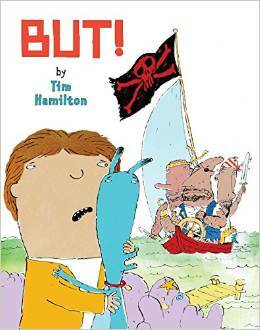 It's a bit zany, and features Tim Hamilton's wonderfully cartoonish drawings. Eddie lives with his dad and his dog in Halibut Bay. It's a nice enough place, but people have cold heads because they don't have hats. the pirates don't need a pair of socks. How will they put socks on a wooden leg? Eddie does some quick thinking and comes out ahead. He solves the problems and makes everyone, even his crabby aunt, happy. This book will not only have you singing along, but checking an atlas, globe, or whatever mapping app you might have. It's downright fun and a great addition to the "Over in" series that Marianne Berkes has been adding to over the years. 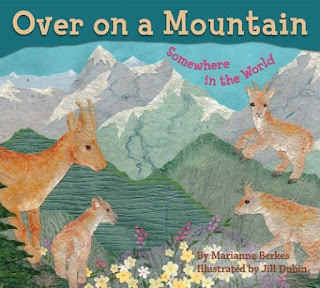 I like it because it's a world tour of mountain ranges - and it has animals from every region. Plus Berkes includes a handy map in case you don't have a globe at hand. Plus it's a counting song... so it's win-win all around. All the animals in the book act the way that Berkes portrays them. Snow leopards leap, bald eagles soar, and penguins waddle. And they live in the mountains as shown in the book. But they don't have as many babies as in her rhyme! There is wonderful back matter for parents and curious kids. Berkes includes mountain facts, reveals the "hidden" mountain animals, and provides more information about the animals featured in the book. There's also an entire page of "tips from the illustrator" - what fun for the budding artist! And, at the back there is music and words for the song in case you're chosen to lead the next sing-along. Today's review is part of the STEM Friday roundup. Drop by STEM Friday blog for more science books and resources. 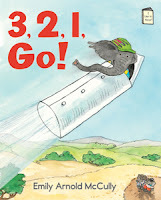 Even though "perfect picture book Friday" is on summer break, you can still check out recent posts at Susanna Leonard Hill's site. She keeps an ever-growing list of Perfect Picture Books. Review copy from the publisher. 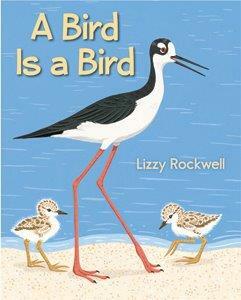 Because, as Lizzy Rockwell shows us, there are some things all birds have in common. They all have beaks - even though some beaks are huge and fat, designed for eating fruit and others are thin and sharp, designed for spearing frogs. But wait! Insects have wings and they aren't birds. Snakes lay eggs, and they aren't birds. So what is it about birds that makes them different from all the other animals? Feathers! And those feathers help birds survive. Using detailed illustrations and text that is poetic and simple enough for a beginning reader, Rockwell shows us what makes birds "birds". Check out Rockwell's book about gardening ~ Plants Feed Us ~ along with some beyond the garden activities. Today we're joining the roundup over at the Nonfiction Monday blog where you'll find even more book reviews. Review copy provided by the publisher. This is a book I chose by its cover. Who can resist Matt Myers's bright splashes of color and wonderfully drawn characters? There's another reason, too.... I met author Liz Rosenberg a few years back, and always enjoy reading her stories. And this one is everything I want in a kid's book: It's fun. It's touching. It makes you slow down and consider how you treat your friends - even when you're mad. The main character is a little girl who, on the very first page, declares: "I'm never talking to James again." They are in a fight. You see, James told Aiden who told someone else who told someone else who.... eventually told her something that made her mad, mad, mad. And so she's not talking to James any more. They are in a fight. Even if James doesn't know it. Even if he asks "are you OK?" or slides her favorite treat onto her desk. 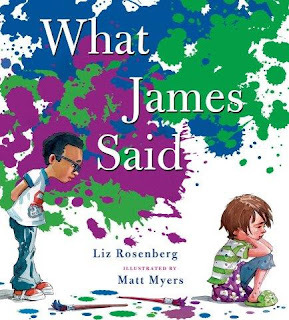 This is such a delightful tale of a typical childhood experience, and I love how Rosenberg reveals their realization that that true friendship can survive a misunderstanding. She was gracious enough to answer Three Questions. Liz: How easy it is for people to misunderstand each other. As a little girl, I was always getting into "fights" with my best friends - I think girls are even more inclined to these dramas than boys. In a school situation it's so easy to unwittingly start a game of he-said-she-said "telephone", where what was really said gets garbled the further the gossip spreads. And I'd never really seen a picture book about that, but I think it's a very real and vital part of our experience. Then, too, I've been through rough patches as an adult. I've had some experience feeling like "I'm never talking to so-and-so again". Then, of course, you do - and if you're lucky the friendship is stronger than ever. Sally: Your characters seem like kids we'd find in the local elementary school. Is there a secret to creating "real" characters? Liz: I'm still a child at heart. I'm pretty darned childish - and of course I have children. I like being around children. That makes it easier to see you children "really are". Sally: How closely did you work with the illustrator, Matt? Liz: Matt and I had worked together on Tyrannosaurus Dad (2011), So I thoroughly trusted him - and my editor, the wonderful Neal Porter. There was no need for collaboration... everything is there in the story. I love every single choice that Matt made. Liz just finished her final revision of her next book - a YA biography of LM Montgomery, the author of Anne of Green Gables. "She led a fascinating, touching life, a life of checkered brightness and darkness," says Liz. "And she was one of my favorite authors as a child. Still is. So this biography is a debt of love. Maybe all real writing is." I just finished listening to the recorded book, Anne of Green Gables, so I can't wait to read Liz's biography on the author! If there were "perfect picture book Friday" today, we'd be there. But even though it's PPBF summer break, you can still check out recent posts at Susanna Leonard Hill's site. She keeps an ever-growing list of Perfect Picture Books. Advanced review copy from the publisher. Looking for some new "easy readers" for just-getting-to-read-on-their-own kids who can't wait for Summer Reading? Here's two - hot off the press from Holiday House. Even though they may look like they have nothing in common, they do: both feature a main character who meets with success in unexpected ways. These "I like to read" stories are are written in simple language that will appeal to newly independent readers. Ann and Bess are playing "school". Min wants to join them, but "you are not ready," says Ann. She draws a line in the sand and tells Min that she may not step over it. When Min leaves, Ann and her friend get back to their game. But Min isn't a quitter. And she doesn't let anything as thin as a line stop her from joining in the play. So she gathers things: a board, some rope, a tube... then with a fun mix of rocket science and make-do, Min finds a way to join her friends. Without stepping across any lines. Grace wants to dance. She tries. She gives it everything she has. 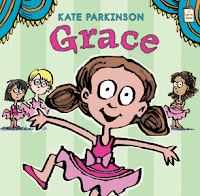 But truth is: Grace was not made for dancing - at least not that kind of dancing. She does, however, have other talents. She loves to draw. And that gives her an idea. A really BIG idea that lets her be part of the dance recital with her friends, but doesn't require a tutu or ballet slippers. There are many books about the water cycle - but I don't remember reading one nearly as fun, nor as lyrical, as this one. 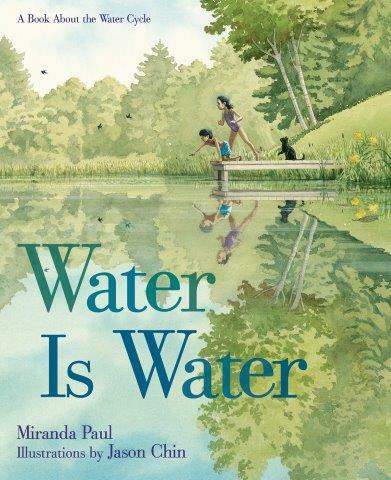 Author Miranda Paul takes us on a poetic journey from raindrops to clouds, from snow to swamp. What I like LOVE about this book: The language. It's spot on. So is the science. I love how we start with one state of matter - rain - and, with a page turn - it changes into vapor. Later it becomes solid (snow, ice). Paul plays with the water cycle: we see the rain, the clouds, the fog, the snow. But we also see steam rising from mugs of hot cocoa, snowball fights, apple cider. These are also part of the water cycle. I always hope for back matter, and Paul does not disappoint. She highlights states of matter, concepts of evaporation and condensation, and then points out that we are mostly water. There's a list of further reading and a short bibliography for curious naturalists. Beyond the book: water, water everywhere. Water mapping: where is the water around you? Is it falling out of the sky? Low clouds? Puddling in the driveway? Gurgling along in creeks and streams? Rushing over rocks and into rivers? Make a list of all the water you can find as you walk through your neighborhood or a park. Where does water go? When it rains, the water rushing down my road collects in a small stream that feeds into a creek that joins the Susquehanna River that empties into the Chesapeake Bay that opens into the Atlantic Ocean. Where does your water go? Get a map. Ask someone from the local water conservation district. Who uses the water? Plants and animals depend on our streams and pools. Some, like frogs and dragonflies, lay their eggs in pools and their young grow up in the water. How do animals and people depend on water where you live? Conserving water. During the hottest days of summer, it might not rain for a month. So we try to not waste our water. When it does rain, we collect water in buckets, to pour on the plants in our garden. After washing dishes, we use the rinse water to clean the kitchen floor. What sort of things can you do to conserve water? Today's review is part of the STEM Friday roundup. Drop by STEM Friday blog for more science books and resources. We're also joining PPBF (perfect picture book Friday), an event in which bloggers share great picture books at Susanna Leonard Hill's site. She keeps an ever-growing list of Perfect Picture Books. Advanced review copy from the publisher. And stayed there ALL night? 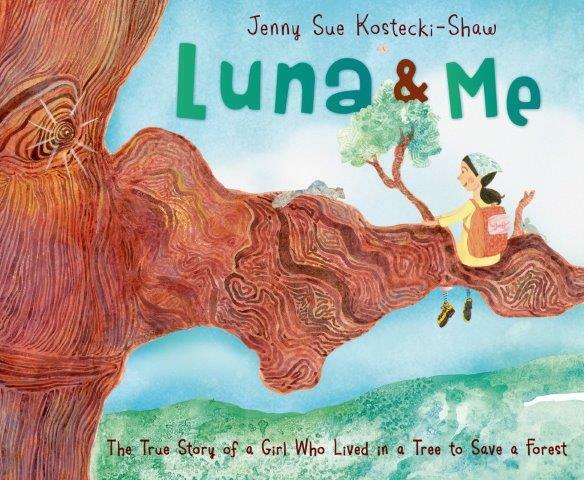 This is the story of a girl who climbed a tree and lived high in its branches for two years. It is the story of a tree born nearly a thousand years ago, and a girl born thirteen thousand full moons later. The tree's name is Luna. The girl's name is Julie, but everyone called her Butterfly. One day Butterfly wandered into an ancient grove of redwoods. She noticed a tree with broken branches and a large blue X painted on its side. That blue X meant that Luna was slated to be harvested and turned into lumber. Butterfly knew that people needed lumber to build their homes. But trees are important, too. They make oxygen (important for breathing) and provide homes for animals. And their roots hold the soil and keep it from washing away. So she decides that if she is in the tree, no one will cut it down. Thus begins her lengthy camp-out in the arms of her tree. Many friends supported her, sending food and other supplies up by rope. Butterfly began exploring the tree, discovering a magical cave and secrets of canopy animals. She documented what she learned and shared it with the world. Finally, after nearly two years, the lumber company agreed to protect Luna and the surrounding grove. You can visit Sanctuary Forest near the town of Whitethorn, CA. Today we're joining the roundup over at the Nonfiction Monday blog where you'll find even more book reviews. Advanced review copy provided by the publisher. 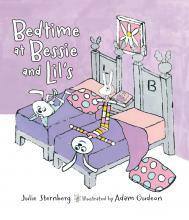 opening: It was bedtime at Bessie and Lil's. Lil was snug in her mother's lap. Bessie practiced her headstands. What I like about this book: the shenanigans! First Bessie. Then Lil. Popping up like prairie dogs. "Look at me! I'm skipping!" Looking for fireflies. Looking at the moon. Doing everything but settling down for the night. Boy! Doesn't this sound like a familiar tale? I love the illustrations, too - especially that Bessie and Lil, though they are siblings and both are bunnies, have ears as individual as their personalities. I like Bessie's striped pajamas and Lil's stuffed carrot and the way they hang off the bed instead of snuggling under their blankets. Beyond the Book: it's bunny season here in the temperate forest and they are hopping all over the place. They hop across my road and into the tall grass. But they don't wear pajamas and they don't read bedtime stories. Do you have a bedtime ritual? Some people drink hot cocoa and listen to stories. Some people go outside and say goodnight to the stars. What do you do? Have a bunny sleepover. Invite all your stuffed animals to a bedtime party and dress them up in pj's. Then read them goodnight stories. 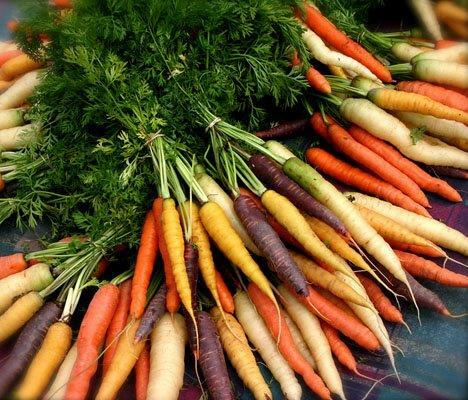 Plant some Rainbow Carrots. They really do grow in a rainbow of colors: red, orange, melon, yellow white, and even purple! But make sure you keep the bunnies out of your garden! You don't need to live on a farm to love tractors. 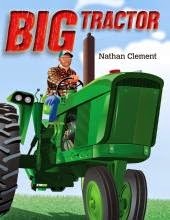 This book introduces young children to all the different things a tractor does on the farm, and lets them get a good look at the huge wheels and the implements. The text is simple, with two lines of text on each page. "Wake up, Ol' Partner," says the farmer, pushing the barn doors open. It's time to hitch up the plow. Then disc the soil and plant the corn (or soybeans or...). Readers follow the seasons through the work of the tractor. I like the break Tractor gets when the combines head into the wheat field ... tractor can hang out in the shade sipping lemonade. But then, before you know it, tractor's back to work harvesting corn - a job that runs into overtime. Good thing tractor comes with headlights. Finally, after all that hard work it's time for some fun - a hayride! And then a well-deserved rest.